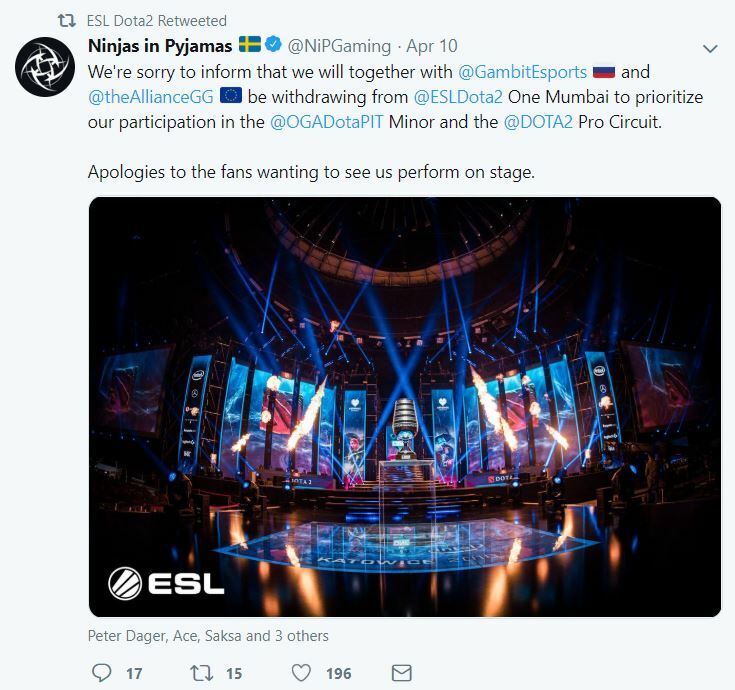 With ESL announcing that 5 teams have decided to drop out from ESL One: Mumbai, fans were understandably disappointed with a few requesting refunds after their favourite teams/players announced that they weren’t attending the event. 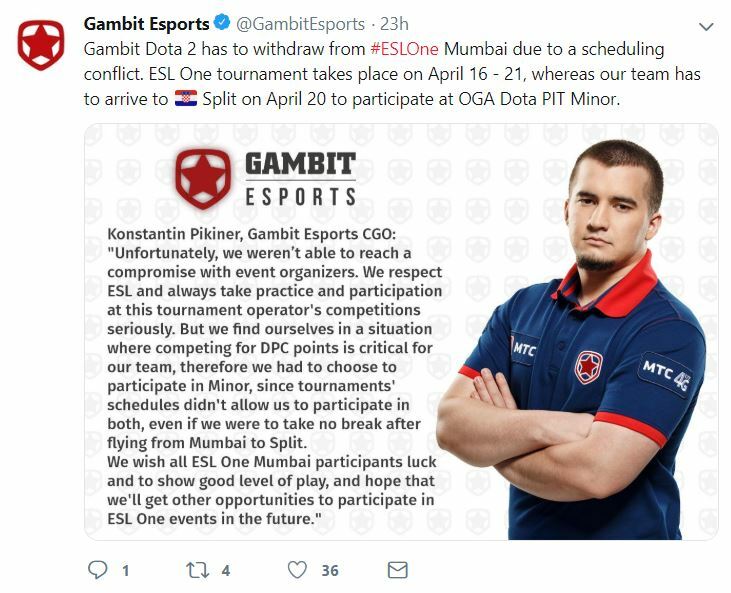 Chaos Esports Club, Ninjas in Pyjamas, Gambit Esports and The Alliance made statements via social media, detailing the circumstances which lead them to drop out of ESL One: Mumbai and apologized to all their fans who were hoping to catch them in action in Mumbai. Ninjas in Pyjamas and Gambit Esports soon followed, stating that they had to understandably prioritize their participation in the OGA Dotapit Minor. “I am truly sad that we had to pull out of ESL Mumbai. We tried to resolve the situation by suggesting a lot of solutions but we ultimately couldn’t come to an agreement that worked for both organizers. Meanwhile, J.Storm hasn’t yet made any statement detailing why they decided to drop out of ESL One: Mumbai, other than this tweet. Unfortunately we are one of the teams that had to drop out of ESL Mumbai. The host of ESL One: Mumbai, Paul "Redeye" Chaloner has also made a video detailing why ESL: One Mumbai will still be a special event, despite 5 teams dropping out from the tournament; 5 days before the tournament kicks off. ESL One: Mumbai 2019 kicks off on 15th April 2019, with the 3-day LAN playoffs being played out in front of a live crowd at the NSCI Dome from 19th-21st April 2019.